Author(s): Filipović Lana, Aranđelović Sandra, Krivokuća Ana, Janković Radmila, Dojčinović Biljana, Radulović Siniša. Institute for Oncology and Radiology of Serbia, Pasterova 14, 11000 Belgrade, Serbia. In vitro biological studies of four trans-platinum complexes of structural formulas trans-[PtCl2(n-acetylpyridine)2] (n = 3 or 4, complex 1 or 2) and [Pt(n-acetylpyridine)2Cl4] (n = 3 or 4, complex 3 or 4) were performed in human endothelial EA.hy 926 cells, in order to evaluate and compare their cytotoxic and antiangiogenic potential. MTT results revealed that trans-Pt(II) complexes exhibited significantly lower IC50 values: 4.0±0.9 μM (1) and 2.1±0.0 μM (2), than cisplatin (27.7±1.3 μM). Combinational drug treatment with N-Acetyl-L-cysteine and L-buthioninesulfoximine strongly counteracted effect of 1 and 2, while the same treatment rather enhanced cytotoxicity of Pt(IV) analogues. 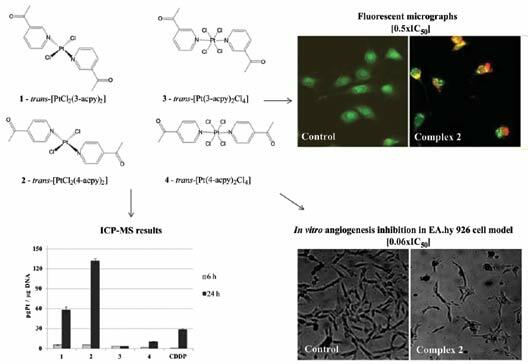 ICP-MS results suggested that differential endothelial toxicity of cisplatin and trans-platinum complexes correlated to the differences in their cellular accumulation, rather than to the different affinity of DNA binding. Intracellular accumulation of complexes (ng Pt/106 cells) for 24 h treatment, decreased in order: 1>2>4>3>CDDP, while ratio of DNA binding (pg Pt/μg DNA) decreased as following: 2>1>CDDP>4>3. FACS/Annexin-V-FITC analysis, and morphological study demonstrated that the enhanced cytotoxic and apoptotic potential (18.1%) of complex 2 was related to its highest affinity to bind nuclear DNA. Pt(IV) complexes exhibited the lowest reactivity to cellular DNA and proteins. Regardless of their antiproliferative action, 1-4 at subtoxic concentrations demonstrated in vitro inhibitory effect on tubulogenesis and matrix metalloproteinases (MMPs) 2 and 9 gelatinolitic activity, while 1 and 2 additionally downregulated MMP-2 gene expression. Keywords: trans-Pt(II)/(IV) acetylpyridines, EA.hy 926 cells, tubulogenesis, apoptosis, matrix metalloproteinases, DNA binding. Affiliation:Institute for Oncology and Radiology of Serbia, Pasterova 14, 11000 Belgrade, Serbia. Keywords:trans-Pt(II)/(IV) acetylpyridines, EA.hy 926 cells, tubulogenesis, apoptosis, matrix metalloproteinases, DNA binding. Abstract:In vitro biological studies of four trans-platinum complexes of structural formulas trans-[PtCl2(n-acetylpyridine)2] (n = 3 or 4, complex 1 or 2) and [Pt(n-acetylpyridine)2Cl4] (n = 3 or 4, complex 3 or 4) were performed in human endothelial EA.hy 926 cells, in order to evaluate and compare their cytotoxic and antiangiogenic potential. MTT results revealed that trans-Pt(II) complexes exhibited significantly lower IC50 values: 4.0±0.9 μM (1) and 2.1±0.0 μM (2), than cisplatin (27.7±1.3 μM). Combinational drug treatment with N-Acetyl-L-cysteine and L-buthioninesulfoximine strongly counteracted effect of 1 and 2, while the same treatment rather enhanced cytotoxicity of Pt(IV) analogues. ICP-MS results suggested that differential endothelial toxicity of cisplatin and trans-platinum complexes correlated to the differences in their cellular accumulation, rather than to the different affinity of DNA binding. Intracellular accumulation of complexes (ng Pt/106 cells) for 24 h treatment, decreased in order: 1>2>4>3>CDDP, while ratio of DNA binding (pg Pt/μg DNA) decreased as following: 2>1>CDDP>4>3. FACS/Annexin-V-FITC analysis, and morphological study demonstrated that the enhanced cytotoxic and apoptotic potential (18.1%) of complex 2 was related to its highest affinity to bind nuclear DNA. Pt(IV) complexes exhibited the lowest reactivity to cellular DNA and proteins. Regardless of their antiproliferative action, 1-4 at subtoxic concentrations demonstrated in vitro inhibitory effect on tubulogenesis and matrix metalloproteinases (MMPs) 2 and 9 gelatinolitic activity, while 1 and 2 additionally downregulated MMP-2 gene expression.